Next, each player antes 1 Gold to the middle of the table. This collection of Gold is what the winner earns! After that, players have the opportunity, in turn order, to take control of the Round of Gambling by playing Gambling or Cheating cards. If no player plays a new Gambling or Cheating card, then the last player to do so wins all the anted Gold! “Gambling? I’m in!”Not only does “Gambling? I’m in!” start a Round of Gambling, but it can also take control of the Round. “I raise!”“I raise!” is a great way to get more Gold out of your opponents. Be careful though, because you have to ante again as well. Many a hero has unintentionally eliminated themselves because they raised with the last of their Gold on what they thought was a sure thing! Winning Hand!The strongest card available during a Round of Gambling, “Winning Hand!” can nearly guarantee that you walk off with a pile of Gold. “Winning Hand!” is not a sure thing though. 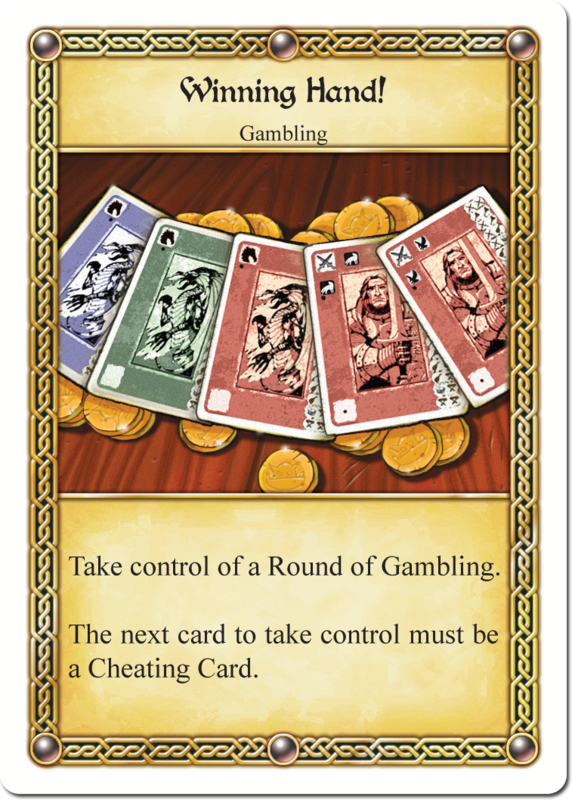 Some of the more roguish or magical characters have access to special Cheating cards. Cheating CardsCheating cards beat all other Gambling cards, even “Winning Hand!”. They are how some of the characters make their own luck. However, Cheating cards are also beat by any other Gambling and Cheating cards. Gambling is not voluntary! If someone starts a Round of Gambling then everyone is obligated to participate unless they have a good excuse. 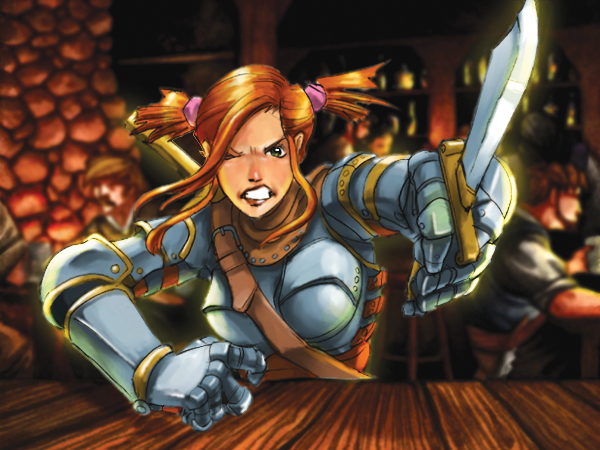 There’s a lot of peer pressure at the tavern! After all, if you can slay a dragon, you can stand to lose a few gold. When it’s your turn in a Round of Gambling you are not obligated to play a Gambling or Cheating card! This is where the strategy of the game is. Electing to pass when it’s your turn does not mean that you are out, folded, quit, etcetera! In fact, the only time you should feel obligated to play a Gambling or Cheating card is if the player immediately after you will win, or if you don’t think anyone between you and the player who is going to win will play one. 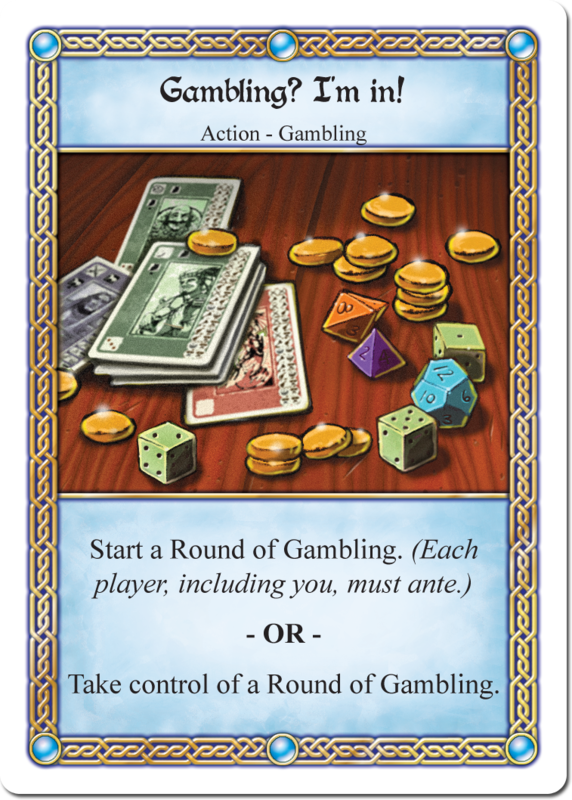 Gambling cards are a rare resource, and you need to make sure you carefully spend them so you have cards left over when someone else plays one after you. Bluffing and strategic planning can win you large piles of Gold with only a single card! On his turn, Gerki plays “Gambling? I’m in!” to start a Round of Gambling. Deirdre plays “Sorry, I have to pray…” to leave the Round of Gambling. She does not have to ante, but she cannot play any Gambling or Cheating Cards for the rest of this Round. Gerki, Fiona and Zot each ante one Gold. Since Gerki started the Round, he’s winning (in control). Fiona goes next. She passes. 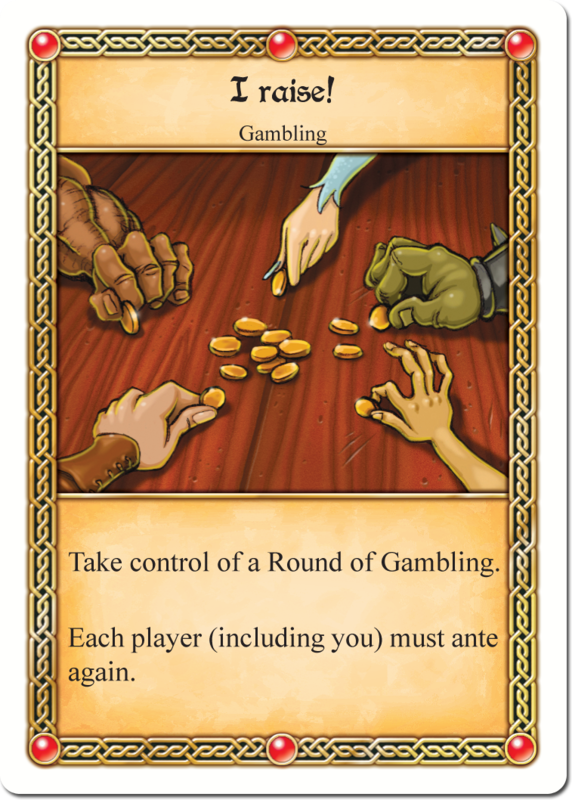 Zot plays “I raise!” a Gambling Card that forces all players in the Round to ante an additional Gold. Gerki, Fiona and Zot each ante one more Gold (bringing the pot to six Gold). 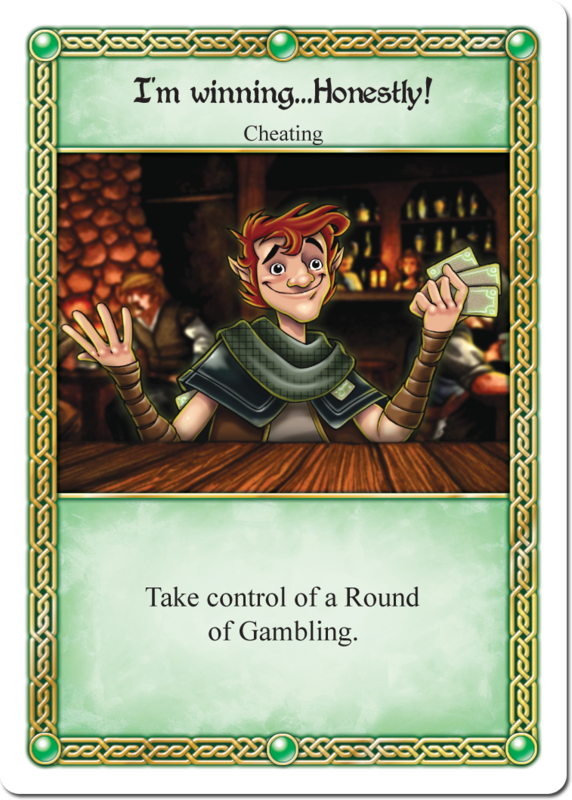 The “I raise!” card also puts Zot in control of the Round of Gambling, so he is now winning. Gerki plays “Winning Hand!” This is a special Gambling Card that can only be beaten by Cheating Cards. Gerki is now winning. Fiona goes next. She passes again. Zot plays “Look over there! It’s the Lich King!” – a Cheating Card. Zot is now winning. Gerki plays “Gambling? I’m In!” In addition to starting a Round of Gambling, “Gambling? I’m in!” can be used during a Round to take control. Gerki is now winning. It’s Fiona’s turn again and yet she still passes. In fact, she watches as Zot and Gerki continue fighting over control. Eventually, in an act of desperation, Zot plays “I raise!” which also happens to be the last card in his hand. Gerki, Fiona and Zot each ante one more Gold (bringing the pot to nine Gold). Zot takes control and is now winning. Gerki goes next. For the first time in the Round of Gambling, Gerki passes. Once again, it’s Fiona’s turn. She looks at Gerki, who only has a single card left in his hand. She plays “Winning Hand!” the only Gambling Card she had this whole time. Zot passes since he has no cards. Gerki passes because he has no Cheating Cards. Fiona wins the nine Gold in the pot and brags about how she only had to play one Card! That’s it for this week. Stay tuned for our next part, where we will cover special sometimes cards that can really throw a wrench into the works!